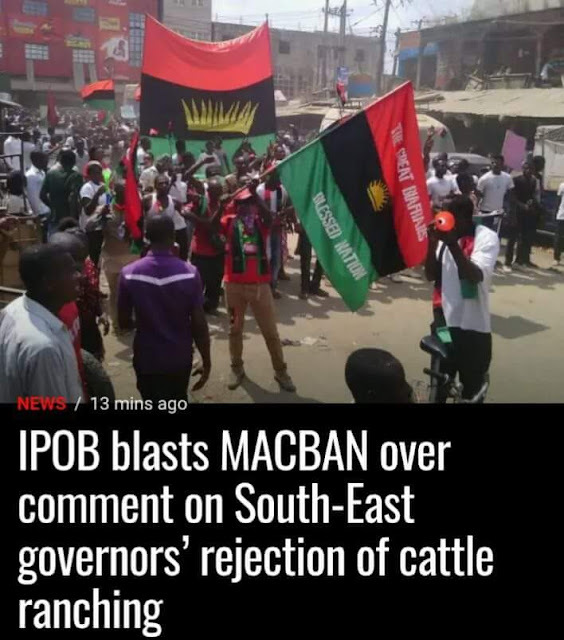 We the Indigenous People of Biafra (IPOB) and it’s leadership worldwide view with utter contempt the recent statement credited to the leadership of Miyetti Allah Cattle Breeders Association of Nigeria (MACBAN) over the recent commendable decision by South East governors to ban illegal movement of cattle between states in the region. The arrogant tone of their statement and implied threat contained therein, against Igbo lives and businesses in the north, points clearly to an impending hostile response from them, which IPOB is both duty and honour bound not to ignore. We must make it abundantly clear that any attack against Igbo lives and businesses in the north, will be met with commensurate response in the south. Threats and large scale invasions of territories in the Middle-Belt may have had the effect of subduing indigenous Tiv resistance to the Fulani hegemonic juggernaut in the Middle Belt and total collapse of morale in the West, given what happened at Ado-Ekiti PDP rally on Wednesday, July 11, 2018. One inevitable outcome of any premeditated attack on Igbo people and easterners living in the north, will mark the beginning of the apocalyptic end of Nigeria as we know it. The sensible decision of hitherto docile South-East Governors to avoid wholesale breakdown of law and order in their region, through the banning of herdsmen activities, should be applauded by Arewa Consultative Forum, Sokoto Caliphate and all advocates of peaceful coexistence in Nigeria, not derided through the mouthpiece of Fulani terrorists the MACBAN. Given that 70% of Nigeria’s land mass is in the north, as we have been boastfully reminded by many government officials and core northerners over the years, it stands to reason and common sense that ranching activities is better suited to the north not ‘tiny’ ‘landlocked’ South-East. Those northern voices that continually pressured Igbo leaders and governors to mistakenly ban IPOB are today silent against the murderous antecedents of their own kith and kin the Fulani terror herdsmen. Had IPOB not been ill-advisedly banned by South-East governors and Igbo socio-cultural leaders, MACBAN would not have had the guts to issue such an insulting statement against Igbo lives and business interests in the north. All South-East and South-South governors must be guided by a popular proverb in Igboland that says, only an irrational man kills his native doctor when those that wish to poison and harm him are still very much around and multiplying. Arewa Consultative Forum and their foot soldiers the MACBAN must know that IPOB will never tolerate their excesses. Fulani terrorist which are in effect Islamic Jihadi soldiers disguised as cattle breeders, cannot be accorded legal protection which is what ranching is seeking to confer on them. Quite literally, a license to kill. It remains the duty of our creator and eternal master, the highly civilized British government, to reign in their favorite but destructive child, the Fulani, before it’s too late. Nobody is contesting the fact that Nigeria belongs to Britain or the preeminence of Fulani caliphate in the affairs of Nigeria as ordained by them. What we IPOB are asking for and on behalf of those other ethnic nationalities in the Middle-Belt that are too weak to speak for themselves, is to be left alone in peace in the land of our ancestors. The fate of Somalia is an ever present reminder of what can become of a country when a stubborn tribe or recalcitrant head of state is hell-bent on taking the path of political suicide.